Fidan Ana Kurtulus, assistant professor of economics at the University of Massachusetts Amherst, has been awarded a prestigious Early Career Research Award from the W.E.Upjohn Institute for Employment Research, based in Michigan. The award recognizes research by young scholars within six years of receiving their Ph.D. with the potential to make important contributions to U.S. employment policy. Kurtulus is a labor economist and is working on research in two primary areas: employee ownership and participatory workplace practices; and the causes and consequences of workplace diversity. Her latest projects examine the long-term effects of affirmative action legislation on the U.S. employment landscape since the Civil Rights Movement; and the link between employee ownership and employment stability during the recent recession. This entry was posted in Kurtulus on March 15, 2012 by . The goal of this study is to examine whether women in the highest levels of management ranks of firms help reduce barriers to advancement in the workplace faced by women. Using a panel of over 20,000 private-sector firms across all industries and states during 1990-2003 from the U.S. Equal Employment Opportunity Commission, we explore the influence of women in top management on subsequent female representation in lower-level managerial positions in U.S. firms. Our key findings show that an increase in the share of female top managers is associated with subsequent increases in the share of women in mid-level management positions within firms, and this result is robust to controlling for firm size, workforce composition, federal contractor status, firm fixed effects, year fixed effects and industry-specific trends. The influence of women in top management positions is stronger among federal contractors, in firms with larger female labor forces, and for white women. We also find that the positive influence of women in top leadership positions on managerial gender diversity diminishes over time, suggesting that women at the top play a positive but transitory role in women’s career advancement. This entry was posted in Kurtulus, Working Papers on July 13, 2011 by . Working Paper: What Types of Organizations Benefit From Teams, and How Do They Benefit? What Types of Organizations Benefit From Teams, and How Do They Benefit? Using data from a large cross-section of British establishments, we ask how different firm characteristics are associated with the predicted benefits to organizational performance from using team production. To compute the predicted benefits from using team production, we estimate structural models for financial performance, labor productivity, and product quality, treating the firm’s choices of whether or not to use teams and whether or not to grant teams autonomy as endogenous. One of the main results is that many firm characteristics are associated with larger predicted benefits from teams to labor productivity and product quality but smaller predicted benefits to financial performance. For example, this is true for union recognition as measured by the number of recognized unions in an establishment. Similarly, when a particular firm characteristic is associated with lower benefits from teams to labor productivity or product quality, the same characteristic is frequently associated with higher predicted benefits to financial performance. This is true for the degree of financial participation and employee ownership and also for establishment size and a number of industries. These results highlight the advantages of analyzing broader measures of organizational performance that are more inclusive of the wide spectrum of benefits and costs associated with teams than the labor productivity measures frequently studied in the teams literature. This entry was posted in Kurtulus, Working Papers on July 12, 2011 by . Fidan Ana Kurtulus, assistant professor of economics at UMass Amherst, has been awarded a prestigious 2011 Michael W. Huber Fellowship by the School of Management and Labor Relations at Rutgers University for her research on employee ownership and shared capitalism. The fellowship recognizes Kurtulus’s trailblazing research on participatory workplaces. 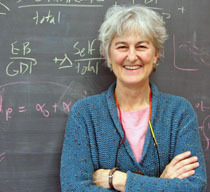 Her analysis of worker attitudes towards employee ownership, worker participation, and profit sharing has appeared in leading publications such as the Industrial and Labor Relations Review and the 2011 Annual LERA Research Volume Employee Ownership and Shared Capitalism: New Directions and Debates for the 21st Century. Kurtulus’s latest research, co-authored with economist Douglas Kruse, explores how worker participation can mitigate economic downturns. Kurtulus states, “Companies with employee ownership have shown greater employment stability in face of the current Great Recession. It’s remarkable that better workplace organization can soften the impact of even a severe macroeconomic crisis.” These results were widely cited, including coverage in the New York Times, after Kurtulus presented them in May 2011 at the London School of Economics. In 2009-2010, Kurtulus was a J. Robert Beyster Fellowat Rutgers University. She is one of several UMass scholars recognized for work on shared capitalism. Other recent fellowship recipients include Daphne Berry, a doctoral candidate at the Isenberg School of Management, Dustin Avent-Holt, a doctoral candidate in Sociology, and Dr. Erik Olsen and Dr. Philip Melizzo, both recent alumni of the UMass Amherst Economics Ph.D. program. With a new certificate in Applied Economic Research on Cooperative Enterprises and a cluster of scholars in the shared-capitalism network, UMass Amherst is a leading center for research on participatory workplaces. This entry was posted in Graduate, Kurtulus, UMass Economics on June 21, 2011 by . How could public policies promote and expand this shared capitalism? Public policies already offer companies tax benefits for setting up employee stock-ownership plans, and these could be increased. It would also be relatively easy to encourage companies to offer more workers incentive pay based on company performance. In a report published by the Center for American Progress in March, Professors Freeman, Blasi and Kruse point to a strange anomaly in current tax policy: Companies are allowed to write off costly stock options that represent incentive pay for top executives, despite a lack of evidence that such incentives lead to improved company performance. Why not restrict the tax benefits to companies that provide the same type of incentive pay for all full-time employees, stipulating that the value expended on the bottom 80 percent of employees by salary must equal at least that expended on the top 5 percent? Similar restrictions have long been in effect for employee retirement and health plans. The costs of these programs are not tax-deductible unless they are offered in a nondiscriminatory way to all workers. Private-sector precedents are also strong. Two very successful American companies, the Wegmans supermarkets and Cisco Systems, offer broad-based incentive systems that effectively meet these restrictions. If America’s capitalists mean what they say about the virtues of an ownership economy, they should throw their weight behind modest changes in tax incentives that could expand it. If they don’t, we might infer that they prefer to keep the benefits of ownership to themselves. This entry was posted in Folbre, Kurtulus on June 1, 2011 by .